This photo that's been going around purports to show all the little critters found in a single drop of seawater, magnified 25 times. It's a beautiful photo, but there's just one problem: it's not really a single drop of seawater (though it is probably magnified 25 times). 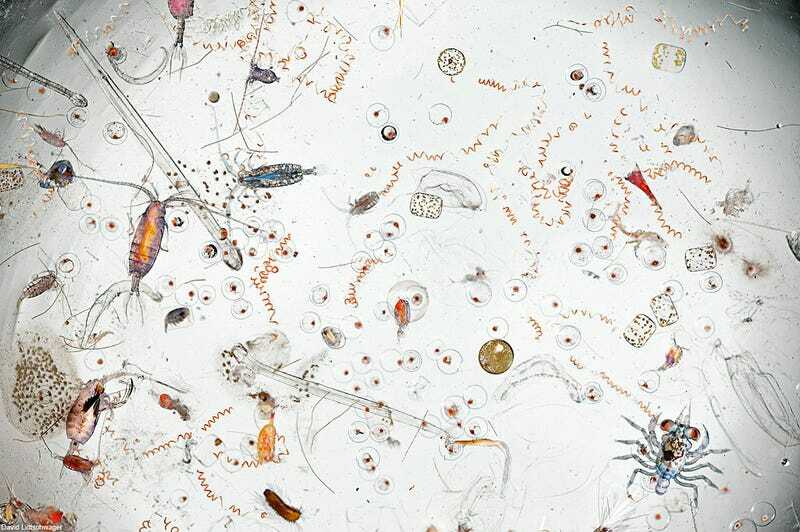 It's not as if the photographer, David Littschwager, strolled out into the sea, extracted an eye-dropper's worth of sea water, and placed it onto a plate to photograph. Instead, a giant net collected up a bunch of zooplankton from a bunch of seawater, concentrating a swimming pool's worth of the tiny organisms into a container the size of a drinking glass. Miriam Goldstein explains at Deep Sea News by providing this photo, a "bongo net," designed to capture a bunch of zooplankton. "The cod ends are the solid white bits on the right side. That's where the zooplankton end up." What collects at the closed end is a beige-ish sludge of watery plankton-y goodness. When you put all that beige goop under the microscope, you get the "single drop" in the viral photo above. My God, it's filled with critters! But it's the critters from a pretty big swathe of ocean, artificially brought together. Amazing, beautiful, slightly terrifying? All of that is true. A single drop of seawater? Not so much. Does the notion that all of that is bound up in a single drop of water somehow make for better science communication? I'm not sure. Science doesn't need to be inaccurate to fill the human mind with awe. Head on over to Deep Sea News to read more and see more photos describing the process through which plankton gets collected.